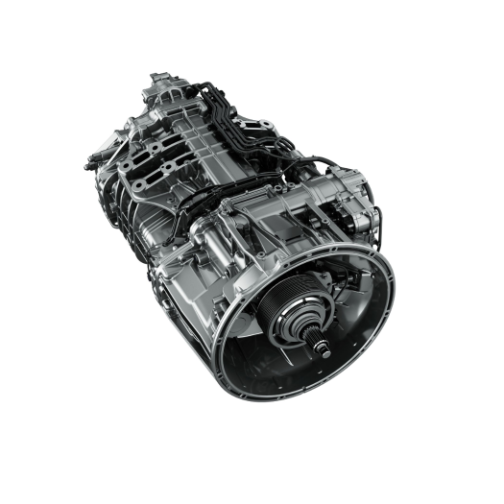 NAPA VALLEY, Calif. – August 8, 2012 – Detroit Diesel Corporation today showcased the Detroit™ DT12™ automated manual transmission. 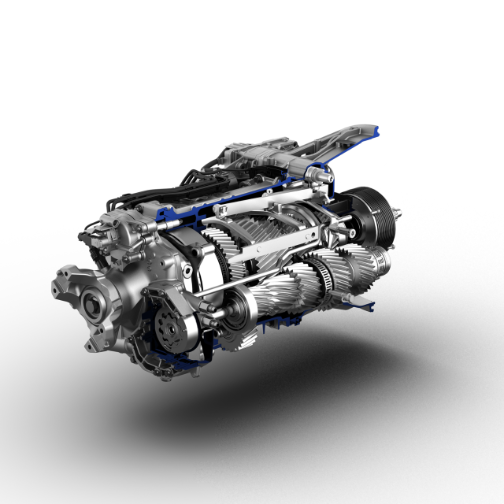 Part of the Detroit complete powertrain offering, the DT12 combines the operational ease of an automatic with the efficiency of a manual transmission, resulting in enhanced fuel economy, vehicle performance and safety. Available in the Freightliner Cascadia®, the DT12 maximizes fuel efficiency for line-haul/long haul operations. Adding to the transmission’s overall economy is its lightweight design, which offers additional payload because of its aluminum housing and single counter shaft. The DT12 improves slow-speed maneuvering capabilities without compromising high road speed efficiency. The 12-speed, direct- or over-drive automated manual transmission combines a traditional manual gearbox with high-speed, computer-controlled shift and clutch actuators that automatically and seamlessly select the right shift pattern and perfect clutch engagement for fuel economy and engine power. The DT12’s creep mode simulates a torque converter to improve low speed maneuverability for parking, docking, heavy traffic and other low speed situations. Advanced technologies include Skip Shift, which automatically skips gears, enabling the transmission to run through lower gears faster to achieve cruising speed sooner; and eCoast, which allows the vehicle to ‘coast’ down grades with the engine operating at idle speeds while preserving vehicle momentum, maximizing fuel efficiency. “The ability for the transmission and engine to share information fully leverages our integrated powertrain, providing a significant advantage to the driver,” said Williamson. A proprietary control module communicates with the entire powertrain, giving the transmission and engine the ability to share information and offer complimentary functions, which gives the Detroit transmission an advantage that only a proprietary powertrain can provide. For example, the engine can limit torque to protect against driveline damage and harsh shifts, while the transmission can optimize shifts to keep the engine in the sweet spot. Drivers will also appreciate comfort features such as helical gears and geometrical optimized gear-cut for noise reduction; pneumatic clutch and shift actuation for faster gear shifts; and a choice between eco or power-mode configuration. Additional advantages for the driver include a true two-pedal system for ease of operation; and a kick-down feature that improves vehicle acceleration when needed. Easy serviceability, routine maintenance intervals and a comprehensive warranty program further extend the value of the Detroit transmission. The DT12 comes standard with a 5-year/750,000 mile warranty, with a 2-year/200,000 miles warranty on the clutch. The DT12 is also equipped with Virtual Technician, the factory installed on-board diagnostics system that takes the guess work out of powertrain repair. When a check transmission light illuminates, the fault is sent to a contact and the Detroit Customer Support Center (CSC) who can analyze the issue. The driver receives a service recommendation and the nearest authorized location with parts in stock. The Detroit Customer Service network provides immediate access to maintenance information, and with hundreds of authorized locations in the United States and Canada, factory-trained technicians are always available. For more information about Detroit, go to www.DemandDetroit.com. Detroit offers a complete line of heavy-duty diesel engines, axles and transmissions for the commercial transportation industry in both the on-highway and vocational markets. Detroit™ engines, axles and transmissions are sold and serviced through a network of more than 800 locations throughout North America. For more information, or to locate the nearest Detroit location, visit DemandDetroit.com. Detroit™ is a brand of Detroit Diesel Corporation, a Daimler company.